I've just signed up. What do I do next? Navigate to My Account > Registration Info > My Carrier Accounts to enter your carrier account(s). Next navigate to My Account > Registration Info > Shipping Profiles to create at least one profile. You will then be able to create labels on your own account(s). To invite your partners, navigate to My Account > My Partners > Invite More Partners. I received an email invite. If I accept do I need to pay? No. 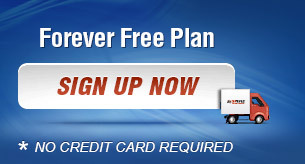 Simply sign up for our Forever Free plan. You will be able to generate labels for the Accountholder that invited you without paying. No. Our plans are month to month so you can cancel at anytime (we do not refund prorated amounts if you cancel in the middle of your billing cycle). I signed up for free to generate labels for another Accountholder. But I also have my own carrier account. Can I use it? Yes. After Sign In, navigate to My Account > Payment Info to upgrade your plan to one that provides the approx. number of labels you need to create each month. Next, enter your carrier account(s) at My Account > Registration Info > My Carrier Accounts. Finally, enter at least one Shipping Profile at My Account > Registration Info > Shipping Profiles. Now you can start generating labels on your own account(s), as well as inviting your partners to create labels. One of my partners called saying they cannot create labels because the system tells them that they do not have a Shipping Profile assigned. What do I do? Navigate to My Account > My Partners > Partners Connected to assign shipping profiles to your partners. Our system requires the Accountholder to assign a Shipping Profile when sending invitations. Thus, upon accepting invites, Partners can start creating labels directly. However, since an Accountholder can delete a Shipping Profile, it is possible for Partners to become unassigned. Every time I create a label, the system tells me the Ship From address may be invalid. What can I change so it doesn’t happen again? For your convenience, we default the Ship From address from your profile info at My Account > Registration Info > Contact Info. Simply enter a valid address recognized by the carriers on that page. Yes, you can void a shipment. Select My Account from menu. Select the blue number/link to open the list of labels. Select the Void shipment link.